When John Bramwell introduces two songs in a row as being about “drinking…and disaster” it raises a big laugh from the audience at Concorde 2 in Brighton on Friday night; but it occurs to me that it would be the perfect title for the next I Am Kloot album. Drinking is important in the Kloot world - either in songs, on stage or off it - but there is nothing disastrous about it from the point of view of those of us who appreciate the brilliance of this band. The opening lines of To The Brink are a dark joy: “Do you fancy a drink?/I know a place called the brink/Do you want to go there?” And despite running the risk of getting too serious, the lyrics stand up to close analysis: “They’ve got no rule of thumb/So on the counter I strum/With my fingers”. The rhyme and consonance of “thumb” and “strum” is purely poetic, and the close proximity of “thumb” and “fingers” is sublime. He further evokes the experience of the solitary drinker in the crowd with the lines, “I would like to stay with you/But I leave alone”; and when he repeats the refrain, but exchanges “stay” and “leave”, the effect is heart-breaking. It is for this reason that I Am Kloot are more highly rated by their peers than music consumers: Pete Doherty has said that Bramwell is one of the most talented songwriters in the country and Guy Garvey has proclaimed the band to be the most underrated in Britain. 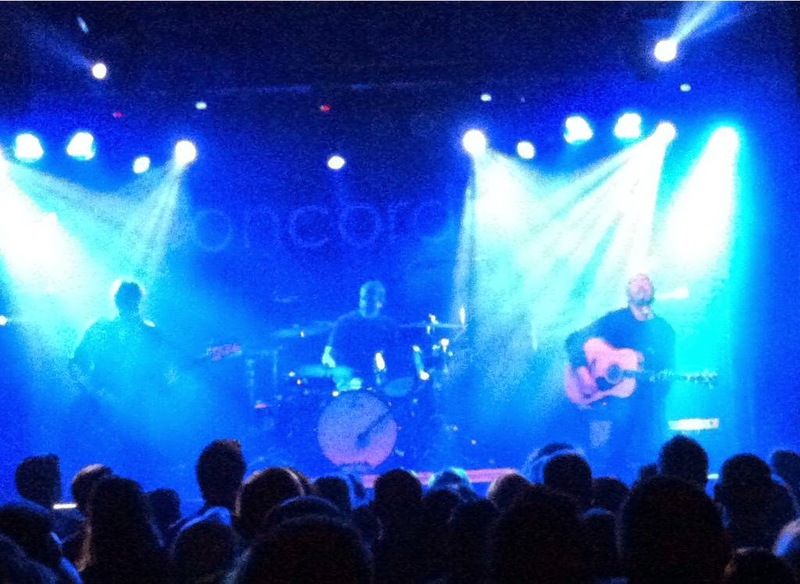 The last time I saw I am Kloot in Brighton, they had just released their sixth studio album, Let It All In, and the songs on the night were largely taken from that and, previous album, Sky at Night. But Friday night’s set was drawn from all six studio albums and even included 1999’s debut single, To You, and This House Is Haunted, from the John Peel Sessions LP. Bramwell tells a Peelesque personal anecdote about having to pull over to the side of the road in his car because he was so overcome by the song he was listening to – which was, of course, his own This House Is Haunted. If this sounds egotistical, it is not; Bramwell‘s self-deprecating humour about his own immodesty is charming. The first part of the set, with Bramwell on electric guitar, displays the rockier side of the band: Cuckoo and Life In A Day, from their eponymously-titled second album, are followed by the title track from the follow-up, Gods and Monsters. But then electric is swapped for acoustic and, after the customary solo spot to allow for no-longer-sedentary bassist Pete Jobson and drummer Andy Hargreaves to have a fag break, we are in to middle-period I Am Kloot with Someone Like You and Ferris Wheels from the Play Moolah Rouge album. Ferris Wheels strikes me as the consummate Kloot song, with all their favourite motifs present: shooting stars, satellites, stars at night and, of course, the sky. When I last saw the band live, they were augmented to a six-piece; but tonight it is just the core trio and the audience are called upon to help with some of the arrangements. We are rubbish at being accordions earlier in the set but by the time the evening is nearing its close, we are great at being trumpets on Northern Skies. And when they encore with Twist - possibly my favourite - and Proof, we are fully committed to shared vocal duties. 'Hold Back the Night: I Am Kloot Live', has just been released on Walk Tall Recordings.